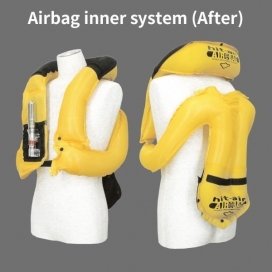 hit-air airbag system | horse | - hit-air - Werable Airbag | Mugen Denko Co., Ltd.
Airbag instantly inflates when a rider is thrown from the horse. 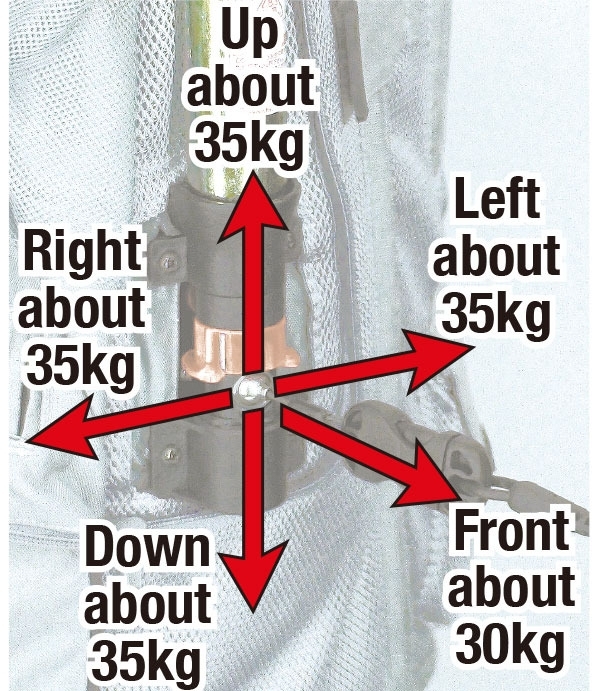 In a fall or crash, the shock-buffering protection system will be activated instantly after the distance from the rider to the saddle exceeds the "Activation Distance", when the key ball is pulled out of the key box to release CO2 gas into the neck, back, chest, side and hip airbags to inflate them and to absorb the impact on rider's body. 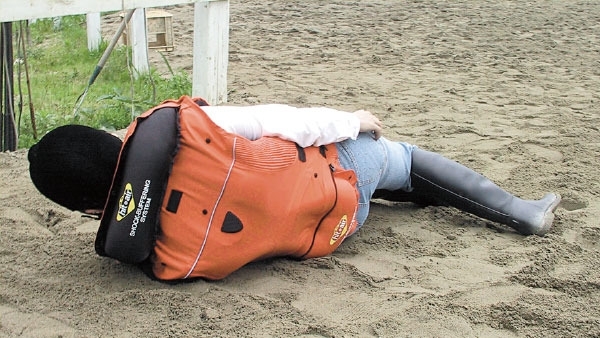 As soon as the rider is thrown from the horse, the airbag inflates and protects rider’s neck, back, chest, sides and hip. 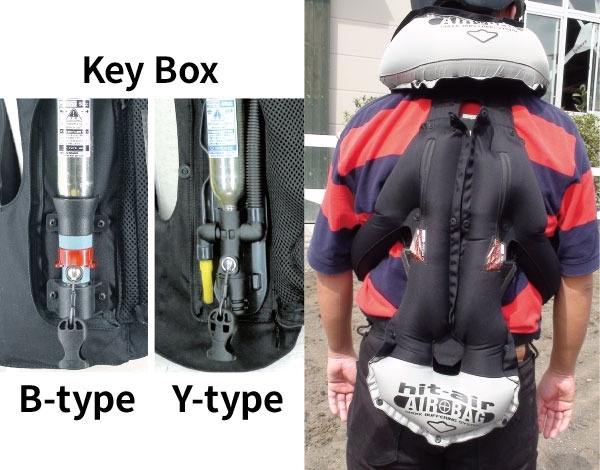 Hit-air is rider’s wear containing shoulder, elbow and back padding (back padding is only for vests) and airbag system. 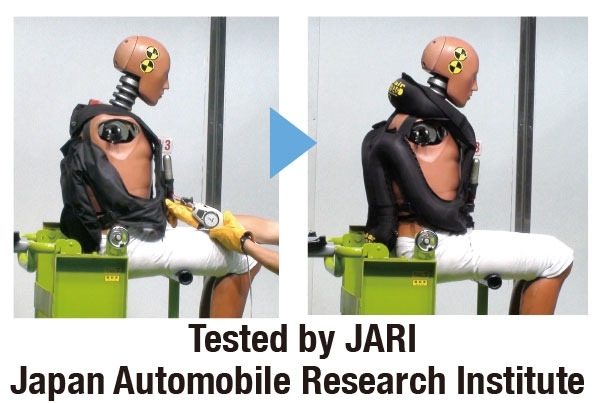 Shock-buffering protection system will be activated immediately after the distance from the rider to the horse exceeds the “activation distance”, when the key ball is pulled out from the key box to release CO2 gas into the neck, back, chest, side and hip airbags for lessening the effect of impact on rider’ body. 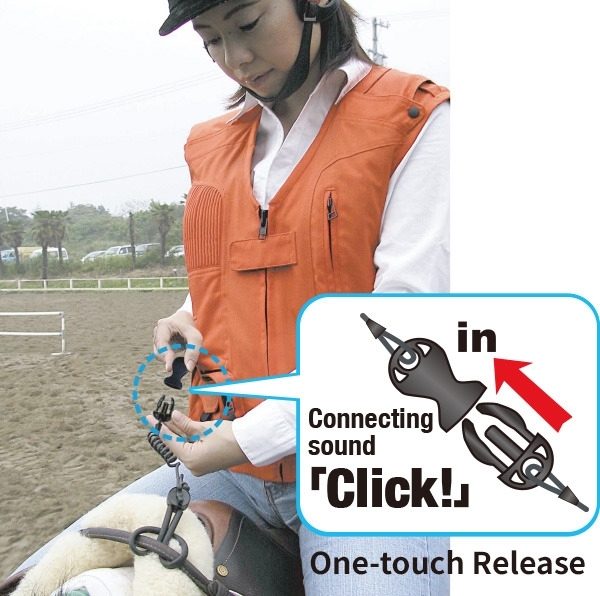 Getting on and off the horse, one-touch release makes it easy. 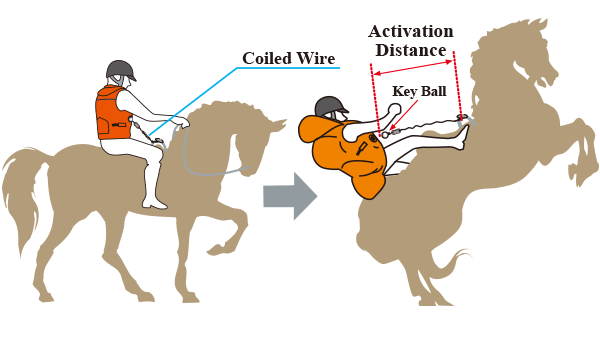 Easy connection/disconnection of the coiled wire by one-touch release when getting on/off the horse. 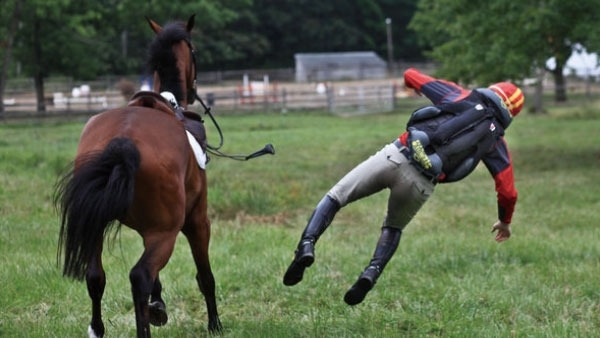 If a rider forgets to disconnect the one-touch release when he gets off a horse, he may feel the pulling force which will not be strong enough to activate the airbag system, but will remind him that he has forgotten to do so. Hit-air can be re-used repeatedly. Unless it is damaged by the previous activation, it can be re-used byre placing the CO2 cartridge. 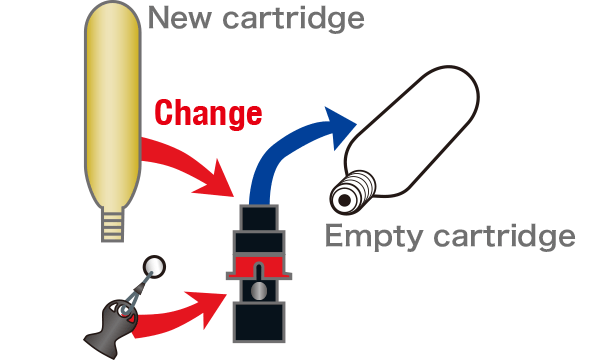 Do not reuse the gas cartridge once used. A CO2 cartridge with a hole at its bottom is unusable. 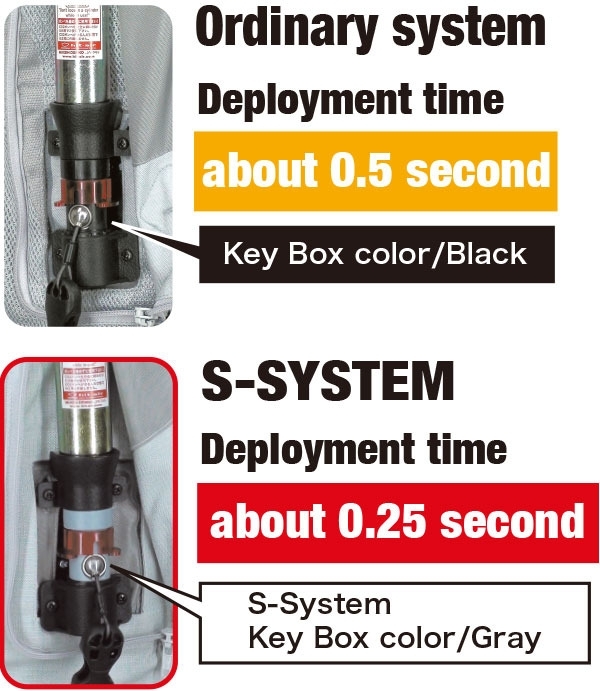 《S-System》Speed up of airbag deployment!